I was reading some old Dear Friends from Sew Beautiful magazine and I came across this one from May, 2005 which was in celebration of 100 issues of Sew Beautiful. I thought you might to read this especially as we celebrate 30 years of Martha Pullen Company in 2011! God is so good all the time. I send my love to you. 8 Finally, brother, whatever is true, whatever is noble, whatever is right, whatever is pure, whatever is lovely, whatever is admirable-if anything is excellent or praiseworthy-think about such things. 19 And my God will meet all your needs, according to his glorious riches in Christ Jesus. As we celebrate publishing our 100th Sew Beautiful magazine I would like to reflect a little. Sew Beautiful began as a pipe dream with no money to fund the dream, no magazine staff, no computer in the business—just a dream. I had written several books on heirloom sewing which were quite well received. Having been established since 1981 the business was bumping along with a lot of joy for a lot of people but was struggling financially. We had a dream of creating a magazine with our beautiful heirlooms, full sized patterns, smocking design plates, lots of ideas for sewing, techniques for heirloom sewing-in effect what Sew Beautiful was and still is. I had a personal dream to give the credit, publicly to God for the whole magazine as well as the whole business. It was critical to me that scripture and this Dear Friends page be included in every magazine. It was and is. For my scripture for this special magazine, I have chosen a few of the verses I clung to when Joe and I were trying to make a decision whether or not to plunge in. This meant selling retirement property to fund the magazine. Joe really believed in the magazine more than I did in the beginning. I was never concerned that it would be loved by everyone who loved heirloom sewing; I was terribly troubled about how we would finance it and keep it going. Repeating in my heart and mind daily were Philippians 4:13 and 19. Armed with clothes from everyone I knew who sewed beautifully, their children and grandchildren for models, Joanna in her beautiful clothes, Scott Wright to do the layout and design, Kathy McMakin to help me write, Patty Smith to do the majority of the sewing and many prayers from many people, we published the first issue, “Back to School,” in the fall of 1987. The rest is history and God has been faithful to always keep us going. School of Art Fashion Fun! Let me have the pleasure of telling each person reading this how much you mean to me. Many people are here in Huntsville enjoying pre-days at our 30th Anniversary School of Art Fashion. And many more of you are enjoying your sewing right in your own home. I love you all. For sure. Making heirloom clothing or quilts or crafts or "whatever" is one of the joys of sewing. These are things which cannot be bought in a store. These are the things of which memories are made. So many times I tell about the Easter clothes Mama made for me and of the trips to Kennamer's Mill End Store to pick out patterns. Mama always loved Vogue patterns since she thought they were the most stylish. If you can believe it I think they were available in Scottsboro, Alabama a town of about 3000 when I was growing up. Or Mama might have bought those patterns in Chattanooga on another occasion. Whatever the case the joy of sewing is in my heart today and the memories are very vivid. I know you are making those memories today at your sewing machines. I wish every one of you were here at our school. I would love to hug each of you. Since that is not possible I just send a hug via this blog. I know most of you get the newsletter and I'll have lots of pictures to share. By the way the March/Easter Sew Beautiful is a dream beyond a dream for those who love heirloom sewing! I know you LOVED the White Issue but if you can believe it the March issue (not mailed yet) is even more beautiful. My only regret for this issue--and I have read it through twice already even with the big school going on--is that each picture and each garment could not have had a full page. If you love hand sewing this is going to be your favorite issue. If you love machine embroidery this is going to be your favorite issue. It is elegant beyond elegant and full of "dreams" and "memories." 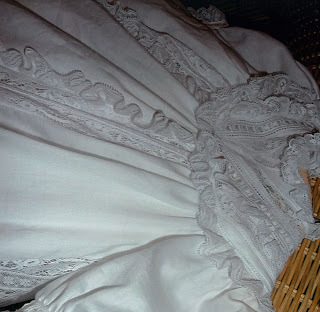 From grown girl's cotillion dresses to a pattern for a Christening dress that is indescribable. White, pink blue--almost every color under the rainbow. Wait until you see Chris Tryon's technique for embellishing a woman's dress or top around the waist. It would take ten pages to even describe the joy of this issue. And I need to go to bed before a full day of fun and pure heart's delight at the school tomorrow. I just wanted you to know that I am thinking about you too!!! All of my friends who could not be here. I send my love as always. This has been a wonderful day. We are finishing the packing on the gorgeous kits just for our students coming to the School of Art Fashion next week. When I tell you that the kits are gorgeous, I truly mean it. I have had fun sitting in the conference room packing some of them. Iris and her team have the pieces beautifully cut and ready. I was part of the final assembly group. You might be interested in knowing that we cut over 35,000 kits a year! Just packing a few of the kits made my fingers itch to sew. This morning I was out on a frantic search for a new song for my dance next Friday night. No luck so I guess I will use the one I have already planned. I do have a brand new costume! With a wig! You will see pictures week after next on the newsletter I am sure. "Dearest Martha, I am writing you and sending these pictures because I am so proud of my little daughter-in-law Caroline. 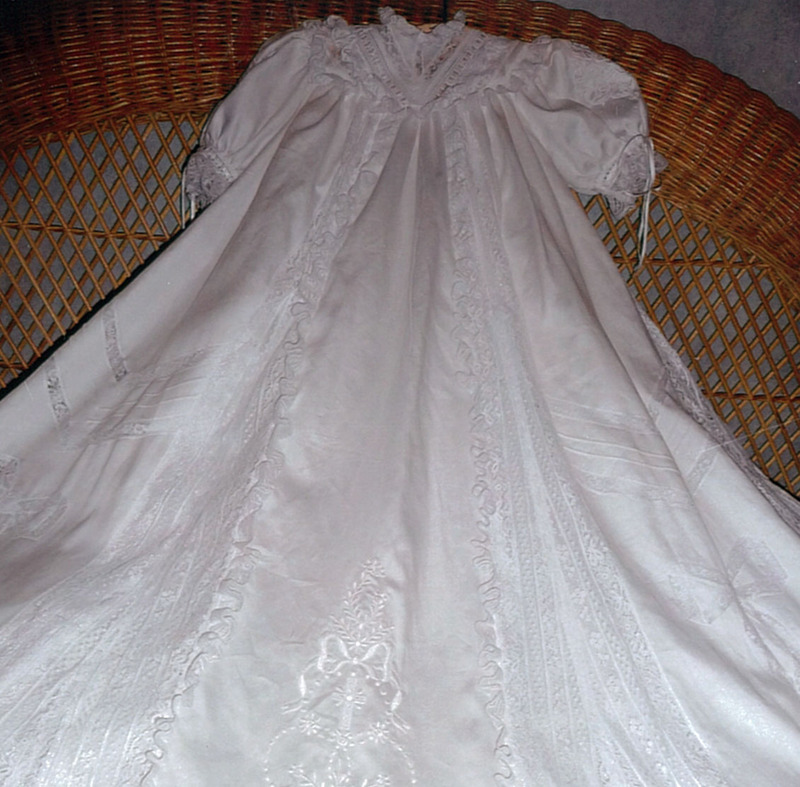 I have been sewing your methods for many years for grandchildren and great grandchildren. Caroline was going to be a grandmother so she wanted to make a christening dress for the baby. She has always admired my sewing, so she decided to go to Alabama and take one of your classes. This dress is the outcome of her classes. When i saw it I was so proud of her. I just wanted you to see it too. She is a strong Christian lady. May God Continue To bless You, Alyce"
Alyce this dress is magnificent!!!! 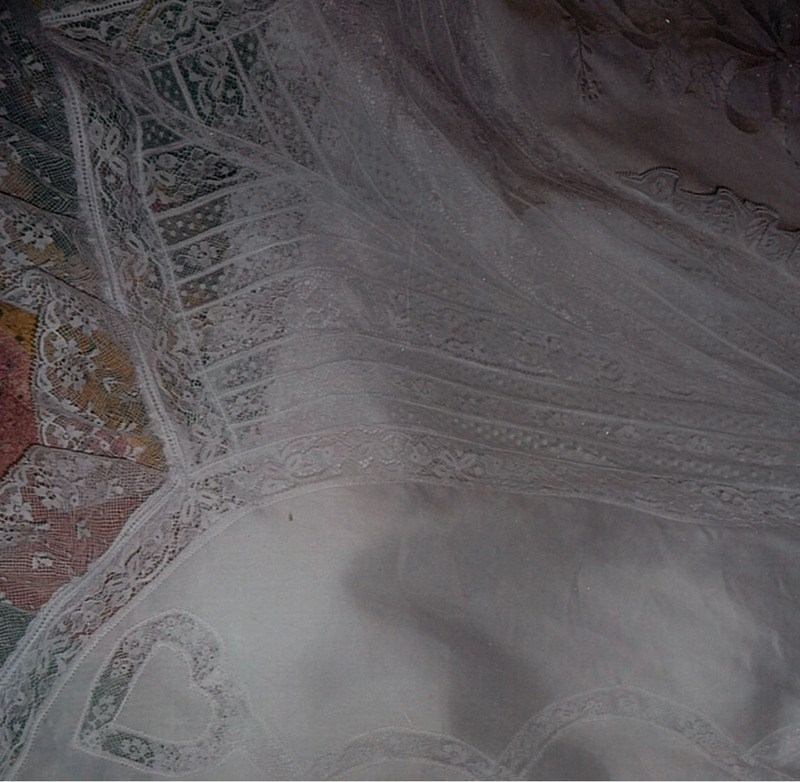 I am thrilled to see that she used the gorgeous machine embroidery designs from our IEC a couple of years ago! 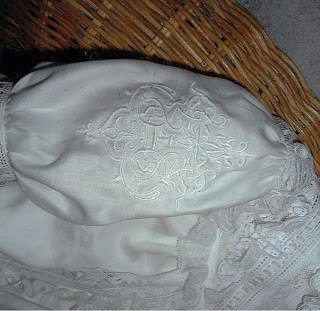 The pattern is Christening Gown Ensemble which was Joanna's first child's gown-Cecil Elizabeth. 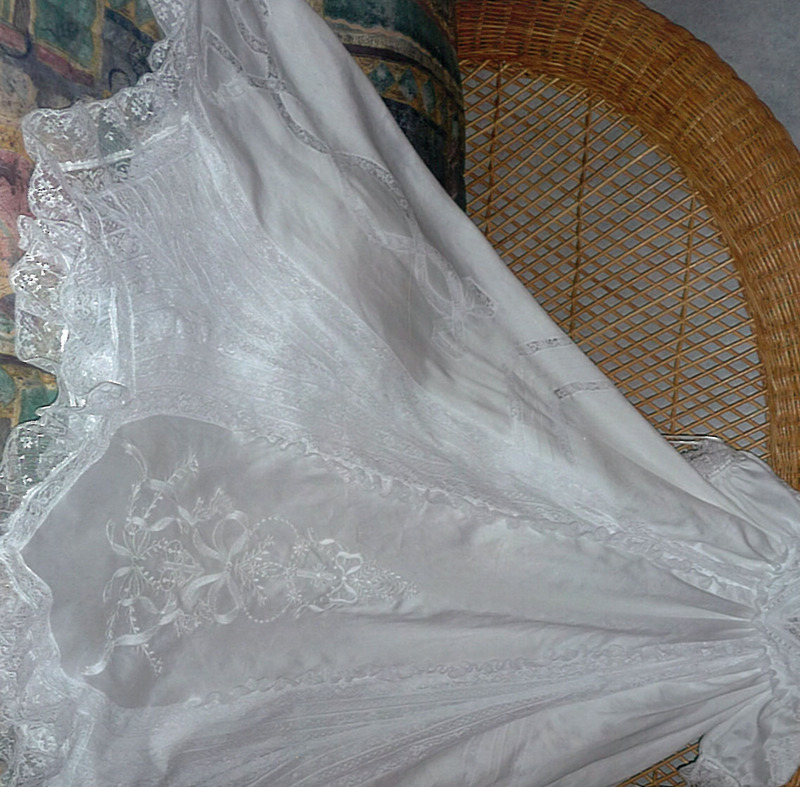 It is a glorious pattern and has about 115 yards of lace in the gown. I cannot tell you how much I loved seeing Caroline's work and how much I appreciate your note. I remember fondly going to Corpus Christi and conducting workshops there. Then we enjoyed the gorgeous Texas beaches and the seafood of course. Thanks so much for writing. 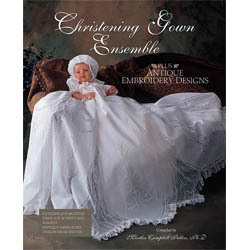 And if any of you want one of my all time favorite christening gown patterns, just call and order Christening Gown Ensemble. 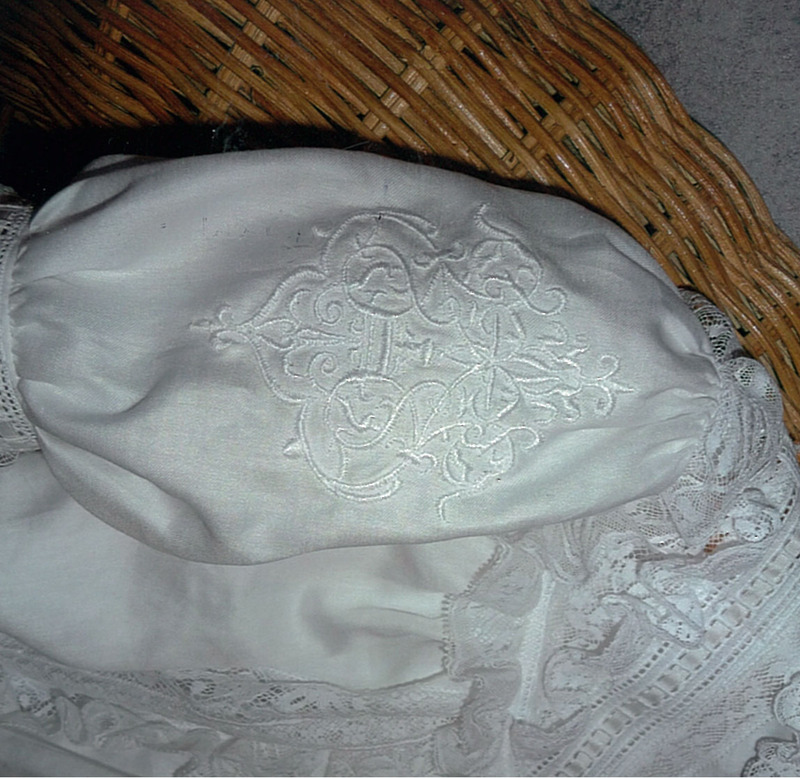 It is actually a little booklet with the pattern for the gown, a bonnet, a slip and a christening blanket.It also has nine pages of gorgeous antique embroidery designs you can stitch by hand or machine.